This is a "bare bones" facility at the county fairgrounds. Restrooms were quite clean - showers fairly clean (but I kept my flip-flops on to shower. Shower at the end got hotter quicker. Electrical outlets for hair dryers, etc., available. Full hook ups and dry camping are available. Dry camping is $15/night. The bathrooms are locked up on weekends unless the weekend worker opens them for you, which he did. We pulled in about 3 pm and checked the "self sign in kiosk" but there were no check in envelopes available. Luckily, we had some, and put our check in there. The weekend worker came to check on us (to see if we needed anything) at about 7 pm. Apologized for not checking with us earlier but, because of the fires, they were busy readying the back pasture for horses to be brought in from ranches in the burning areas! The gate on Crest St. Closes at 9 pm. 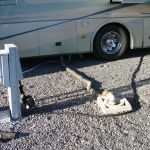 This is the easiest access to RV Park. 50/30/20 available in electric, easy to access sewer line and water. Is it scenic? No - but a great place to spend a couple of days to see Crater Lake and other parks. Personnel very friendly. Bring mosquito spray! A previous patron mentioned flies, but we had none. But we did have mosquitoes! No shade. But in July highs were mid/high 80's, lows in the 50's. There are dog poop bags at the little sign-in kiosk. No fenced pet run, but plenty of grass area between the pull-thru FHU spaces and the back-in dry camp spaces. Lots of trash cans for trash in FHU area. Well lit at night - so if you have a hard time sleeping with lights, bring window blockers or a sleep mask! Spaces are fairly level and gravel, a little lower around the utilities. I would definitely stay here again if in the area. Just need to check to see if there are events that might impact availability. We camped at Klamath County Fairgrounds in a Motorhome. We stayed 2 nights to see nearby NPS sites. The park has a 3 night maximum stay limit. The park is located in town close to services. The best access is off of Crest St when the gates are unlocked. The interior roads are a mixture of pavement & gravel. They are sufficient to maneuver larger RV's. The sites have P/T access contingent on other site usage. The P/T sites were long enough to say connected to a toad. The parking pads are gravel. This park seems to understand the simple concept of the importance of a flat, level site as the sites were generally level and flat but there was shallow swale near the utility connections. They have full hook ups - water, electricity (50/30/20 AMP), & sewer. 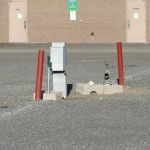 The sites were large enough to select the utility connection placement. The sewer connection was above ground making it difficult to establish a downhill flow depending on discharge point. Sites had sufficient room for opening slides. Distance established privacy between the sites. Sites didn't have an outside table or fire pits as open fires are prohibited. Site orientation didn't allow RV's to cast shade onto the patio side. Very few trees so there was nothing to interfere with satellite reception. No cable. The park brochure made no mention of broadcast channels. Didn't try to get any OTA channels. No park provided WiFi. Our Verizon WiFi hotspot worked well. Didn't try the NET10 phone so don't know about cell phone reception. No designated fenced pet area. There was 1 bag dispenser and collection station for waste at the self registration station. There were garbage cans around the RV area for waste & trash. There was sufficient area to walk dogs along the park's roads & grounds. Preferred arrival time is during office hours: Monday - Friday, 8:00 AM to 5:00 PM. Preferred method of payment is cash or check. Credit Cards accepted during office hours only with a fee charged. We camped at Klamath County Fairgrounds in a Motorhome. We stayed here in 2014 when we needed work done on our towed. The RV park has improved since then and appears to be better maintained. We didn't use the restrooms because they're now locked but that's a plus since it keeps the homeless away. The night attendant is a nice young guy who offered to unlock it for us but we declined since we were only staying a few days. Power, water and sewer are all in good shape. A water pressure regulator is a good idea. There's no wifi but cell service is full 4G LTE with VZN or TMo. We camped at Klamath County Fairgrounds in a Motorhome. This is an OK park for overnight when you want to dump and take on water. There is an electric and water area ($15/night) which we didn't see and the full hookup area ($20/night) where we stayed 2 nights while waiting for our toad to be repaired. My wife reports the women's restroom and showers are institutional but serviceable. The men's side was a mess with trash on the floor, broken fixtures, hole in the ceiling, and a commode that appeared to have been the site of a gastrointestinal event of Mount St. Helens proportion. In short, it was disgusting. The fairground is in town, off a major road, so there are people cutting through the area. Some are strange although none appeared dangerous. On a positive note, the young lady who checked us in was very personable. 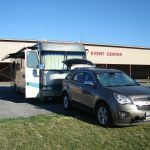 We camped at Klamath County Fairgrounds in a Motorhome. 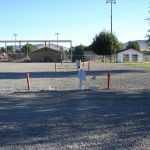 Are you affiliated with Klamath County Fairgrounds ?